I'll round things off now. We'll be publishing highlights of the game at midnight tonight, but before that look out for the highlights from yesterday's Scottish Premiership games from 18:00 BST. Thank you very much for logging on today to follow and join in our coverage. Enjoy the sunshine if it's out where you are. Robbie Devenney: "Same story as last season, Hibs are just incapable of taking our chance #frustrating #bbcscotfootball"
"Hibs were solid throughout. They defended deeper than they would have liked to but ultimately they had the better chances." "You could see the back four looking the same way, as if 'the keeper has got to save that'. Take nothing away from the strike by Tavernier. He got it up, he got it down and it clipped the underside of the bar." James Tavernier's fourth goal of the season gives Rangers an important win over their prospective rivals for the automatic promotion place to the Premiership. Mark Warburton's side go top, while Hibs are left to ponder some missed chances. James Tavernier balloons a free-kick high over the bar. That could be the last chance of the game. Sub Dean Shiels finds space down the right for Rangers but the ball into the box is not precise enough to set up a team-mate. Hibs need to get hold of the ball pronto! We're into the first of four minutes of added time. Hibs go close as sub Sam Stanton clips a pass in for the ambitious Lewis Stevenson who reaches the six-yard box before Rangers clear. Nathan Oduwa's foul gives Hibs a chance 35 yards from goal, but John McGinn's free-kick is over-hit and home keeper Wes Foderingham can collect for a goal-kick. Hibs are running out of time to create a chance. Rangers are spending most of their time in the visitors' half. Former Rangers manager Walter Smith is in the main stand at Ibrox. Rangers boss Mark Warburton sends on striker Nicky Clark for the last 10 minutes. Off goes Kenny Miller. Nathan Oduwa shows some nice footwork down the left, cuts inside but his shot drifts harmlessly wide of the Hibs goal. Alan Stubbs sends on Dominique Malonga to salvage something for Hibs, with Danny Carmichael making way. Lee Wallace is next to go close for Rangers but Mark Oxley comes off his line like a sprinter out of the blocks to save. Frustration for Hibs boss Alan Stubbs as Martin Boyle crosses the ball into the box when there was no-one up to support him. Eight yards from goal, Kenny Miller tries a toe poke rather than putting his boot through the ball and Rangers may not get a better chance than that to score a second. Danny Carmichael makes a terrific run down the left, enters the Rangers penalty box and cuts the ball back for Liam Henderson who, under pressure from his marker, knocks it wide. It's agony for the band of Hibs fans close by. From out on the left, James Tavernier smacks a free-kick high over the defensive wall and in under the crossbar. Mark Oxley was rooted to the spot...until it was too late. Hibs have a glorious chance to score the opener as Jason Cummings gets clear of Danny Wilson and rolls the ball along to Liam Henderson who had an age to take a touch and lash a shot at goal; instead, he hits a right-footed shot first time and the ball sails into the Broomloan Road stand. Rangers centre-back Danny Wilson is next to be cautioned, for a foul on John McGinn. Hibs defend manfully to deny Rangers but the goal threat from the visitors has lessened. Nathan Oduwa, on loan from Spurs, comes on for Barrie McKay. The Rangers fans give the 19-year-old a huge ovation. Fraser Fyvie is booked for an industrial challenge on Rangers midfielder Nicky Law. Rangers captain Lee Wallace gets back to his feet and looks OK to continue. Lee Wallace is writhing in pain on the turf after Martin Boyle's sliding challenge. The Hibs man got the ball but only after sending Wallace down. James Tavernier's cross falls between strikers and Hibs defenders and pings off Fraser Fyvie for a corner as the home side turn the screw. Dylan McGeouch is coming on for Hibs after making a permanent switch from Celtic - David Gray limps off, head down. Hibs goalie Mark Oxley paws a left-footed effort by Jason Holt round the post. There wasn't a great deal of pace on the ball but it was aimed just inside the post - very good save. Craig Meighan: "Got to say I agree with Ross Quinn at 13:13 but if his unwieldy hashtag starts trending I'll eat my couch. #bbcscotfootball"
Hibs get us under way again. "Hibs have Dominic Malonga, Dylan McGeouch and Sam Stanton as subs. I have been impressed with Liam Henderson, he has that ability to play the killer pass. On the bench Rangers have Nicky Clark, who is a goal threat." Well, that was lively. At one point, what with the glorious sunshine and the break-neck pace of the game, I wondered if we might see a water break - would that be a first in Scottish football? A couple of chances fell to each team, with Martyn Waghorn's header over the bar perhaps the best for the home side and Jason Cummings' shot just before the interval probably the best. A draw is fair, I'd say, so far. Hibs midfielder John McGinn is booked for a rather cynical foul on Nicky Law in the middle of the park. At the other end Wes Foderingham saves a less-than-electric shot from 10 yards by Jason Cummings after he had been played in by Hibs team-mate Martin Boyle. Paul Hanlon throws out a hefty leg to divert Lee Wallace's cutback out for a corner. From the set piece Martyn Waghorn finds space to send a "trundler" towards the Hibs goal where David Gray boots it off the goal-line. Robert Muir: #bbcscotfootball stuck in the office in Saudi Arabia on a Sunday following the game on BBC Live, mon the Bears! Ross Quinn: "#bbcscotfootball 3 fouls on Hibs players by The Rangers players & other way we all know they'd be yellows. #sfahouseteamisthetributeact"
Liam Henderson takes a sore one to the top of his foot as Rangers centre-half Rob Kiernan, a long way from the defensive area he normally patrols, challenges him with his studs up. Kiernan escapes having his name taken by referee Steven McLean. Hibs' right-midfielder Martin Boyle shoots at goal but the curl on it takes it away from the target. Martyn Waghorn nutmegs Hibs defender Paul Hanlon 20 yards out and is sent to to the turf by a nudge from Hanlon's backside. The home fans roar for a foul but the referee waves for play on. Nicky Law bustles through the centre circle and is wayward with his pass out to the right. Nevertheless, he manages to pick it up again 30 yards from goal before Hibs' Lewis Stevenson takes the ball off his toe and, with a lovely shimmy which he made look all the better by his left-footedness, brings it out of defence. Rangers midfielder Barry McKay plays a short corner to Nicky Law, who rolls the ball out to Jason Holt - his bizarre shot moves through the air like a welly boot being tossed at a country fair competition. Mark Oxley gathers with ease. Hibs seem to be growing in confidence as the pace refuses to relent. It's a good, open game. Jason Cummings, Hibs' 20-year-old forward, tries to volley home from the edge of the six-yard box but sclaffs at it and a trio of blue-shirted manage to snuff out the danger. The visitors look very capable of scoring today. Former Hearts man Jason Holt is next to pester the men in green and white with a run down the right - again Hibs get it clear. At the other end Lee Wallace tries his luck from 18 yards with his weaker right foot but Hibs deflect it out for a corner. Wes Foderingham seems to lose his marbles for a moment and fluffs a kick-out straight to Martin Boyle but Rangers defender Danny Wilson is back to mop things up like a conscientious school janitor. Robin Tremmel on Facebook: "Come on Hibs! We really cannot afford to lose this one. 2-2 I think." Kenny Miller wins Rangers a corner on the right with a direct run at goal from a throw-in, and from Barrie McKay's resultant delivery Martyn Waghorn out-muscles Lewis Stevenson but heads powerfully over the bar from eight yards. Fraser Fyvie sends a rather beefy pass-back to Hibs goalkeeper Mark Oxley from 25 yards and his touch encourages Martyn Waghorn to race in on goal. The ball deflects to Barrie McKay but Hibs regroup and clear the danger. "Hibs look like they have flooded that midfield area to force Rangers down the sides." Hibs' Liam Henderson makes a lung-bursting 40 yard surge over the halfway line before he loses control and fouls an opponent. Rangers centre-half Rob Kiernan barges in to the back of Jason Cummings and Hibs have a free-kick 30- yards from goal. ..Ah, but his left-footed effort flies high over the bar into the Copland Road stand. It's predictably frantic stuff, with players keen to get a few touches to settle their nerves. Rangers kick off the match. Hibs' new signing Dylan McGeouch is on the subs' bench, while his former Celtic team-mate Liam Henderson starts. 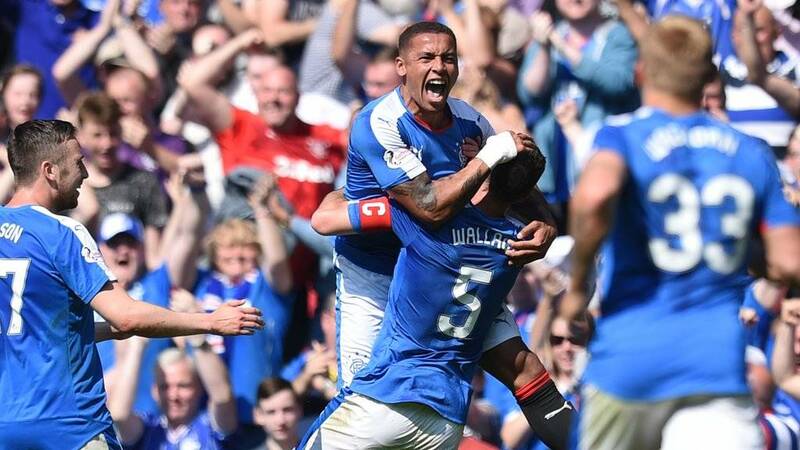 Rangers stunned the Easter Road side early in the season with a 6-2 win in the first round of the Challenge Cup. We couldn't have eight goals this afternoon, could we? "It's going to be a great game of football. Both teams are going to go out and play a great game and it will be a good advert for the Championship. Hibs will come in to this game quietly confident. I think they have two of the last three at Ibrox." "One minute you get called boring, next you're conniving, so what side of the fence do you want to sit on? The most important people on Sunday are not me and Mark, it's the players out on the pitch. These are always strong games. In the head-to-heads last season, they were pretty close affairs. I anticipate and hope it's going to be the same this season." Rangers are third in the Championship table but can leapfrog Queen of the South on goal difference with a win, while Hibernian can pull themselves level with Rangers, Raith Rovers and Dumbarton if they can plunder maximum points this afternoon. "Hibs, if they are going to win, need to score goals and Jason Cummings is by far their best goalscorer." Rangers: Foderingham, Tavernier, Kiernan, Danny Wilson, Wallace, Holt, Halliday, Law, McKay, Waghorn, Miller. Subs: Ball, Oduwa, Clark, Shiels, Kelly, Hardie, Walsh. Hibernian: Oxley, Gray, Hanlon, Fontaine, Stevenson, McGinn, Fyvie, Boyle, Henderson, Carmichael, Cummings. Subs: Bartley, Malonga, McGeouch, Stanton, Reguero, Dunsmore, Martin. Good afternoon and a very warm welcome to BBC Scotland's live coverage of the Championship match between Rangers and Hibernian at sun-drenched Ibrox.